Because San Francisco is a mostly built-out city, most street changes will occur on existing city streets. However, in some locations, new streets will be created as part of major new development areas. Streets built as part of these projects should be consistent with all relevant street design guidelines; in addition, these areas warrant special considerations and present opportunities to design new complete streets from the ground up, with fewer constraints than on existing city streets. New streets should connect to and extend San Francisco’s existing street grid wherever possible. Street designs should read as extensions of public streets, not as privatized portions of master developments. New streets should create a complete multi-modal system that prioritizes walking, bicycling and transit use over private automobile use, connecting to and complementing the City’s larger pedestrian, bicycle, and transit networks. Streets should be designed for speeds appropriate to the street type and surrounding land uses. Within the new street network, roadway width should be minimized while retaining necessary transportation access. 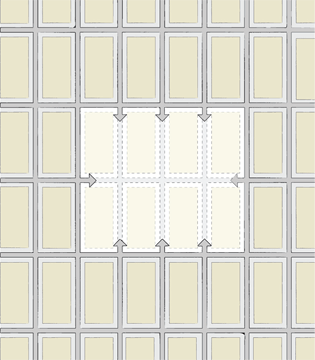 New streets should extend the existing City grid. New streets should minimize overall width. Many pedestrian safety countermeasures such as pedestrian refuges, traffic calming measures, and signage and related engineering measures may not be necessary if the overall width profile of the street is minimized from the outset. Where a new street network is being created, streets should be designed with an overall concept for on-street parking, taking into account adjacent land uses and off-street parking provided as part of new development. 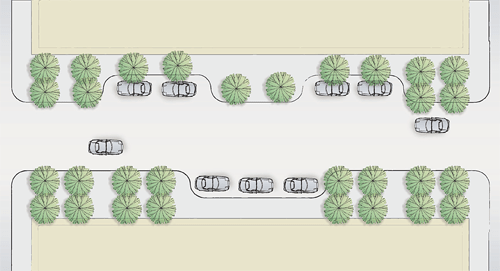 The design of new streets may use strategies such as providing parking pods or bays, or eliminating the parking lane altogether to narrow the overall street width. 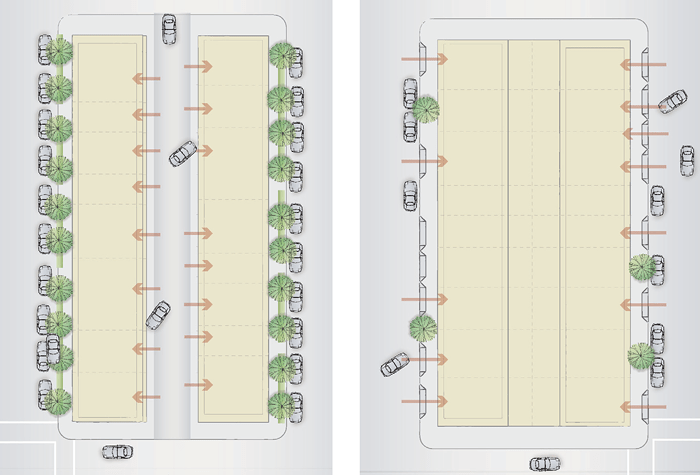 New streets should integrate on-street parking into the overall street design. Where new streets are created, streetscape features can be designed in tandem with new utilities and infrastructure, rather than adjusted to fit around existing utilities. Sidewalk widths, stormwater facilities, and utilities should be designed and laid out to optimize design goals toward a consistent overall aesthetic and functional whole. New development fronting on new streets should minimize curb cuts, using alleys where possible for service and access functions. New streets should incorporate alleys for driveway access. New streets present the opportunity to create meaningful and unique places or designs; new streets may consider unique arrangements that create superior design. 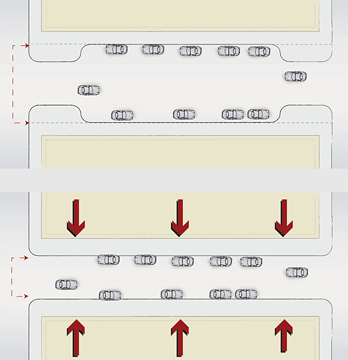 New streets should include, at a minimum, the standard improvements for each street type. Case-by-case additions may be considered as well. Sidewalks on new streets must meet or exceed recommended sidewalk widths. Where consistent building setbacks are provided, the sidewalk width may be reduced by the width of the frontage zone, as determined on a case-by-case basis. Curb extensions should be provided at all corners. Alternatively, on narrow, low-volume, and low-speed streets, designers may consider eliminating the parking lane or using parking bays to create a narrower overall street profile. Where provided, medians should include street trees and understory plantings. New alleys should be designed as shared public ways. Transit stops should be designed to transit stop guidelines. Major new development or redevelopment areas should create a streetscape master plan to guide the selection of streetscape elements, including trees and plantings, lighting, paving materials, and site furnishings; the design of such elements should be internally consistent, and harmonious with the character of surrounding areas. Streetscape elements should come from a City-approved palette, where applicable. Street trees should be planted on all sidewalk lengths, per street tree guidelines. Understory plantings should be included as well on appropriate street types. New development in combined sewer areas must comply with the requirements of the San Francisco Stormwater Design Guidelines. In new development areas, there is an opportunity to create the drainage profile of the street from scratch; the best solution may not always be the standard crowned street. For example, single-surface alleys could be designed to drain to the center of the street, or the gutter may be placed between the parking and travel lanes. Non-standard drainage profiles should be considered on a case-by-case basis, based on functional performance measures. The City is currently developing more specific guidelines for drainage on new streets. New streets should meet the recommended targets for pedestrian lighting. Pedestrian lighting may be supplemented with roadway lighting as necessary to light the street to required levels. New streets provide an opportunity to locate utilities so that they do not interfere with pedestrian circulation and sidewalk activity. Utilities associated with new buildings should be located on private parcels (away from public-facing ground-floor facades) wherever possible. If utilities must be in the right-of-way, they should be located in the roadway as feasible, in the edge zone, or otherwise located to minimize disruption to the overall streetscape. Driveway cuts should be minimized to minimize disruption to the streetscape, maintain a consistent street edge, and reduce conflicts with pedestrians and bicyclists. Alleys should be used wherever feasible for garage access.